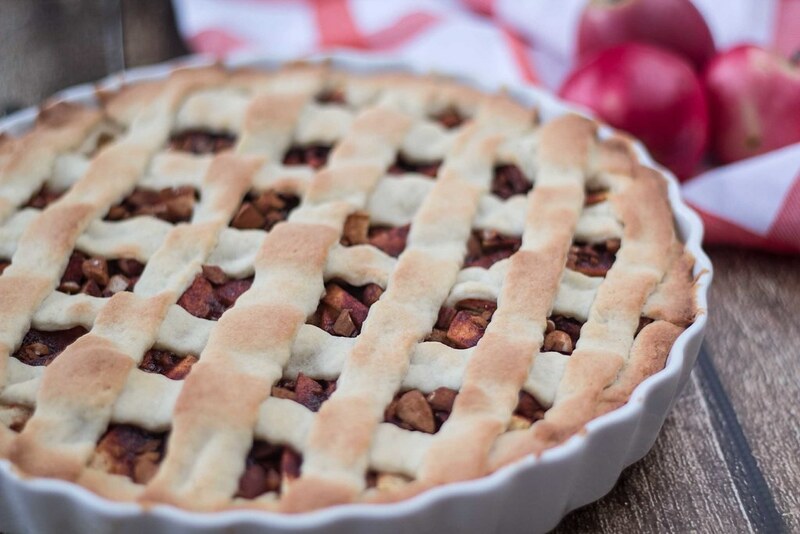 In Denmark and the Nordic countries the fall is the best time of the year to make great apple pies. It’s the time of the year where the apples have spent the entire summer growing big and very juicy. Every year we spent hours in the nature finding and picking bags after bags of all the great ingredients it has to offer. It’s now more or less a tradition that we make elderberry juice and this super easy crumble dough apple pie. 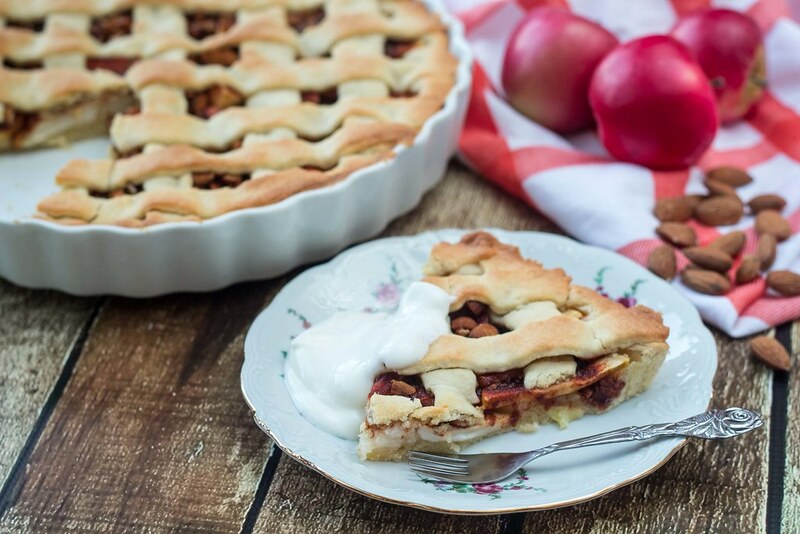 We have now also tried this very delicious apple pie which you can find the recipe for in this page. 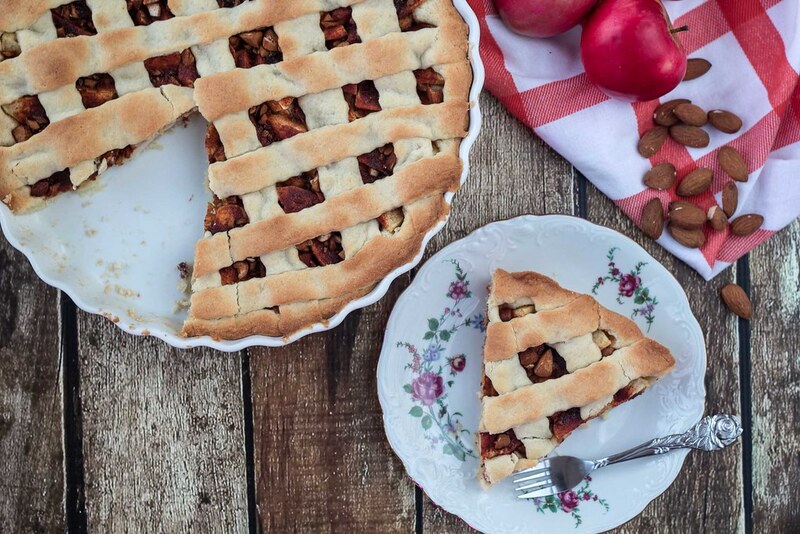 The recipe for this apple pie with cinnamon and almonds are very simple and easy to make – you simple just mix the ingredients for the pie dough, roll it out and place it in pie a dish, then you add sliced apples and sprinkle with cinnamon, sugar and chopped almonds – then you have a crisp and super delicious apple pie. We normally serve this pie warm with sour cream or sometimes our homemade vanilla ice cream. 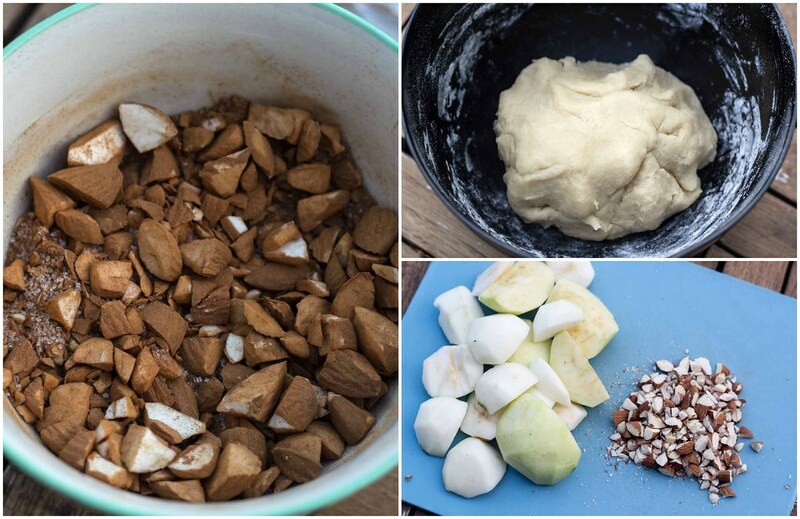 If you are interesting in other recipes where apples are an ingredient see our archive page. We are sure that there is something you would like. 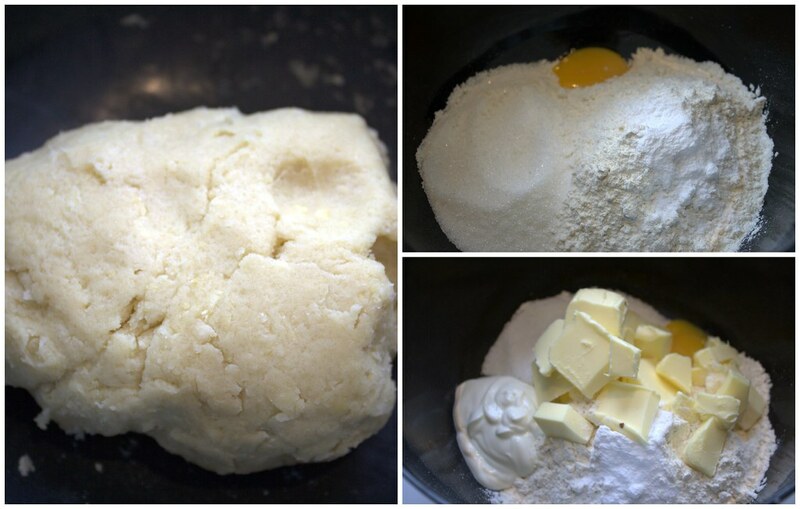 Step 1: In a large bowl, mix/knead the flour, baking powder, 125 g (4.5 oz) sugar, soften butter, egg yolk and sour cream. Keep kneading until the dough has a uniform consistency. Step 2: Place the dough in the fridge for about 15 minutes. This will make it easier to roll it out in the next step. Step 3: Take 2/3 of the dough and roll it out to a flat plate and place it in a greased pie dish with a diameter of about 22 cm (8.5 inch). Make sure the dough is covering the entire bottom and the sides of the pie dish. The last 1/3 of the pie dough is saved for later. 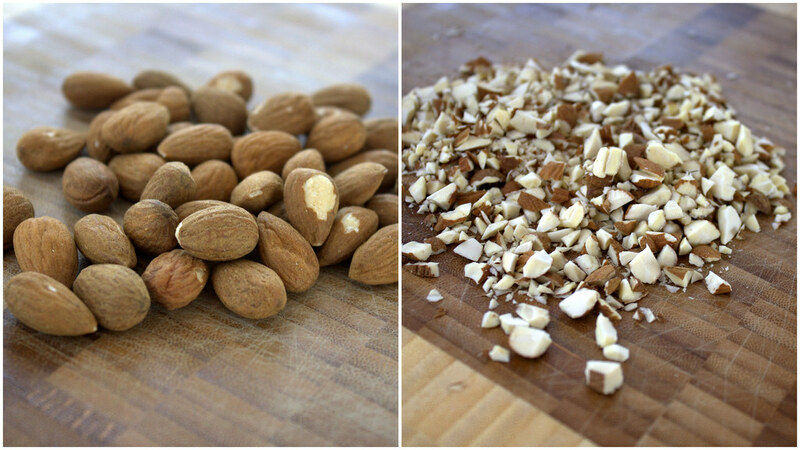 Step 4: Chop the almonds and mix them with 25 g (1 oz) sugar and the cinnamon. Step 5: Peel the apples and slice them. 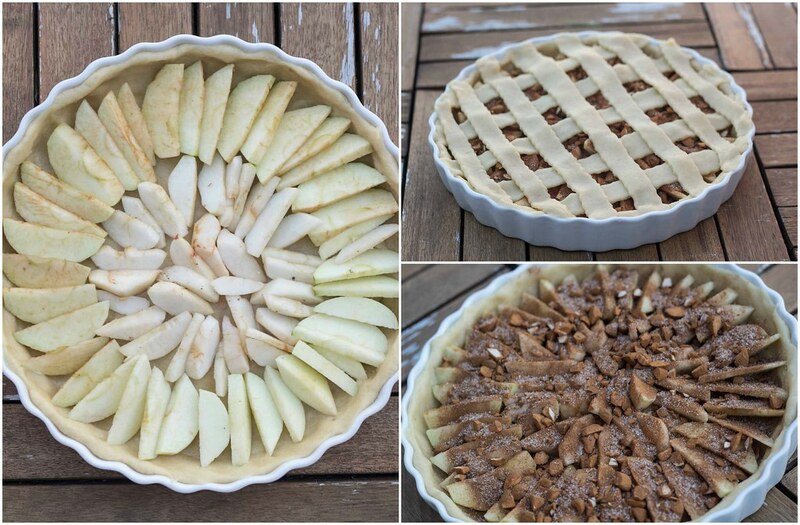 Place the sliced apples at the pie bottom and sprinkle the almond/sugar/cinnamon mixture on top. Step 6: Roll out the last piece of pie dough into a square. Use a knife to cut the dough into long strips. 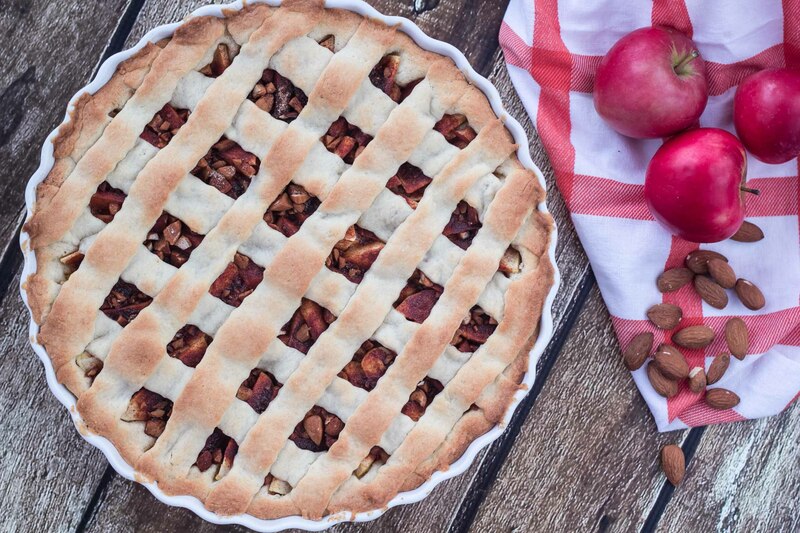 Decorate the top of the apple pie with the strips – we like to make a grid but that’s up to you. Step 7: Turn on the oven at 200 C (400 F) and bake the apple pie at the oven’s middle position for about 15-20 minutes. Step 8: When done, let the pie cool off a bit before serving it.